I am what I like to refer as a free range pet parent. Basically I let my puppy roam freely within certain boundaries in my house using puppy gates. 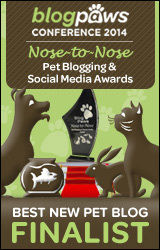 And because I am fortunate enough to be a stay at home dog mom (SAHDM) I keep everyone on a schedule. When a behavior occurs that I don’t want, I simply redirect that behavior to a more positive outcome. As I said before there are times when crates are necessary and I do believe in using them. But as a free range pet parent how do I teach the puppy to remain calm while using a crate? I strongly belive in the idea that a puppy learns many things from their pack. So we started doing rides in the car with Riley and the crate. I have found this tag-team technique to be very effective. Well Mannered – Riley is extremely well-mannered in the car. She never makes a sound while traveling and settles into her blankie and falls asleep. A perfect example of what to do when traveling and in a crate. Because of these reasons, it makes the travel so much easier on the puppy. A little like monkey see monkey do. It really is up to use the type of crate to use. 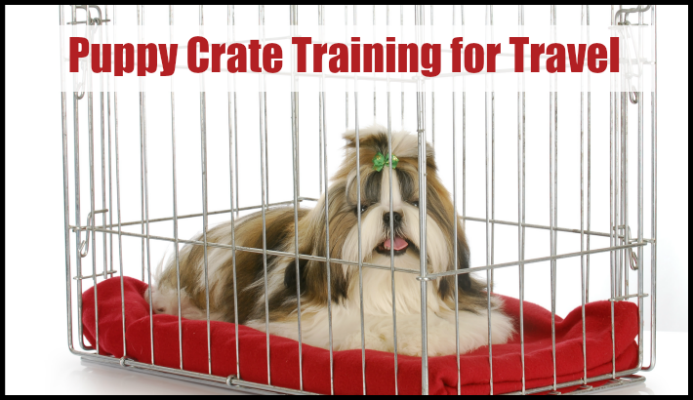 Just make sure if you are teaching the partner technique (car rides only) that the crate is large enough for each dog to lay down comfortably. I uses a Nos-2-Nos because they are the most comfortable for my dogs to stay in while we are at trials. I also love them because Riley and I are able to watch each other on a drive. The Nos-2-Nos also has 3 different points of entry, the top, side & front. They are also collapsible which is great when they are not in use! A hard sided kennel such as a Vari-Kennel is great also. I tend to use my Vari-Kennel more in the winter time as it helps to keep the girls warm when we are either at lure coursing events or agility practice. There is a point when its time for a puppy to travel alone in his new crate. We start with little short trips at first from 10 to 20 minutes. Kevin’s first trips alone were to his puppy class. For the first 10 minutes there was a little bit of crying but he quickly settled down to enjoy the ride. I did not ignore his crying but spoke softly to reassure him it was okay. By his 3rd trip alone in the car he began to settle down and enjoy the ride. For us the final step into loving crates will be teaching Crate Games by Susan Garrett. So be sure to follow us and sign up for our newsletter to watch Kevin’s progress in the upcoming months. Thanks for posting this. We really believe that crate training for traveling is imperative. Not only for your own sanity, but for the dog’s well-being. Thanks again for posting this! Tisheena recently posted…What to Expect At Puppy’s First Vet Visit? It is important for dogs (as well as cats) to be able to stay in a crate at times with being upset or hurting themselves. But I can’t image leaving one in a crate all the time.